Now I know what you thinking. Emus? Really? Sydney, you are just reaching for topics now. And so early in the A to Z Challege, too. So sad. Well, don’t pity me. There is a point to this. 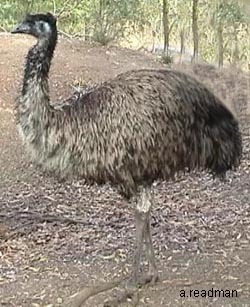 Emus are the third largest bird in the world. It is a flightless bird, but it can run really fast. Up to 36 mph. So, this bring me to my point. I was attacked by an Emu when I was 9 years old. Ok, not actually attacked, more liked chased. When I was younger, my family would spend time at a family friends ranch in East Texas during the spring and summer. This place was just beautiful. They had cows, and horses and chickens. The property was spread out over several 100 acres of the finest land in Texas with a man made lake full of fish. We would spend the day swimming, riding jet skis, eating bar b que and fishing. The first trip of the season when I was 9, there was some new additions to the ranch. They had built an exotic animal refuge. I can’t remember what other animals they had, but I do remember they had an Emu. The only other time I had even heard of an Emu was in the movie Protocol with Goldie Hawn. Goldie’s character worked at a bar called the Safari Club where the waitresses dressed up in animal costumes. Everyone avoid the Emu costume for obvious reasons. One, it is not a very pretty animal and two, no one had even ever heard of an emu. So, seeing one in real life was exciting. To my 9 year old mind, he looked friendly enough. I was definitely more fearless back then, so I decide to climb over the fence and get a closer look at this strange creature. Public Service Announcement! Emus are not nice birds. In fact, they are rather mean. And they run fast. I mean really fast. And when they run fast, they let out this insanely high pitch screeching sound. As soon as my feet hit the ground, that bird took off towards me screaming like, well, like an emu. I was utterly terrified. Thankfully, before it could reach me, my dad literally pulled me out of the cage by my braids. I had forgotten or blocked out this entire incident until recently when I discovered, wait for it. Emus are native to Australia. I am excited for the kangaroos. I can’t wait to see the koalas, but as far as the emus go. I think we can say I have covered that one. Much respect for the Emu. Brilliant story! Well.. I guess you don’t think so. Good thing your dad was there to pull you out! Pulled you out by your braids!! Hahahahaha! This was a hilarious story. Yeah, funny now. Traumatizing at the time. Happy you liked it.